Fig. 2 Location of Punta Restelos Shipwreck. The archaeological research carried out during 2012 involved study of the materials recovered from the site since 2007, which are displayed at the Museo do Mar de Galicia. These include two carriage wheels for a siege gun, boat-shaped lead ingots, medical syringes, a bronze mortar, and a linstock. Once the preliminary study of the materials was complete, the team continued fieldwork research on site. A new area of the Punta Restelos shipwreck was surveyed and mapped using photogrammetry and traditional drawing techniques as permitted by the underwater visibility. Fig. 3 Siege gun carriage wheel 01. 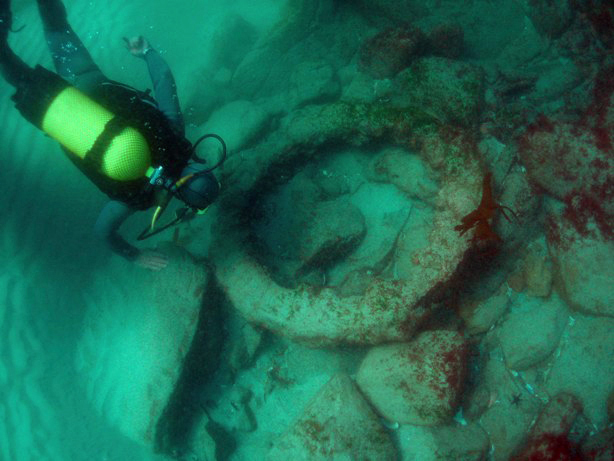 During the archaeological survey carried out in 2007 at the Punta Restelos shipwreck, two carriage wheels for a siege gun were documented and recovered. 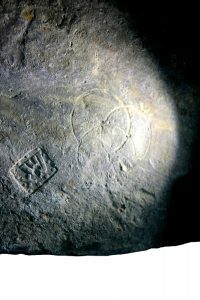 Wheel 01 was exceptionally well preserved (fig. 2) while wheel 02 only consisted of the outer wooden rim. Both wheels have a diameter of 1.6 m. Wheel 01 was preserved with 12 spokes intact and it was possible to observe the metal concretions produced by the iron strakes that reinforced the rim of the wheel. The wheels documented at Punta Restelos are almost identical to those recovered during the excavation of the remains of the Venetian ship La Trinidad Valencera, one of the ships of the 1588 Spanish Armada. During the excavation of this shipwreck, Colin Martin documented the remains of three dismantled siege gun carriages which included five large 12-spoked wooden wheels with a diameter of 1.5 m. They were transported in the hold of the ship to be used by the expeditionary army after landing in England. 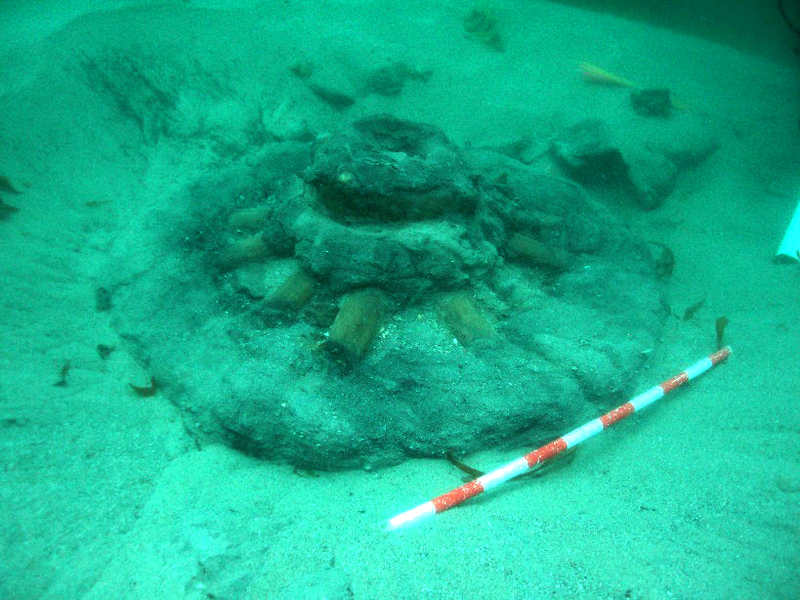 The presence of the same type of wheels in the Punta Restelos shipwreck suggests that the same concept can be applied in this case since the objective of the 1596 Armada of Martin de Padilla was to deliver an expeditionary army to Ireland. This type of 12-spoked gun carriage wheel can be observed in a contemporary drawing in the Archivo General de Simancas (fig. 3). Fig. 4 Siege gun carriage wheel 02. 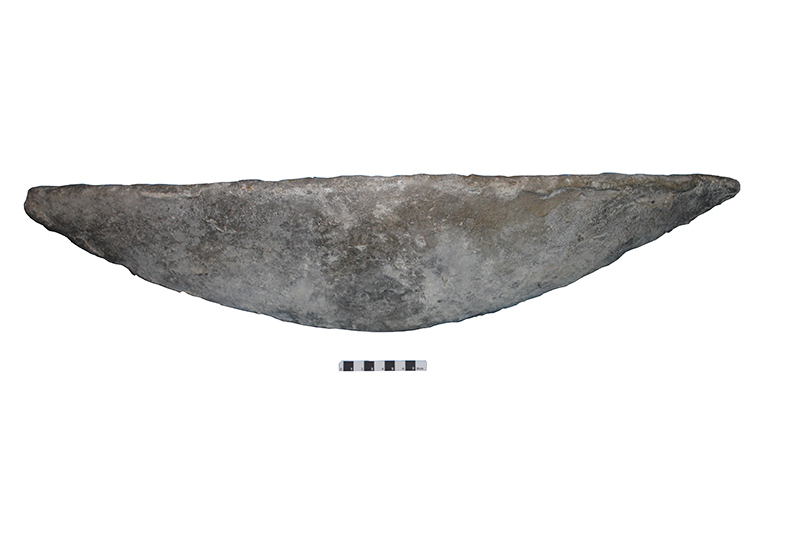 Boat-shaped lead ingots have also been recovered from the Punta Restelos shipwreck (fig. 4). These ingots are similar to those documented in the shipwrecks of the Spanish Armada of 1588 such as Santa Maria de la Rosa, El Gran Grifon, and La Girona. Seven ingots, weighing a total of 440 kg were recovered from Punta Restelos. These ingots were used by the soldiers of the expeditionary army to cast bullets for their muskets and arquebuses. All the ingots except one have a similar weight between 1-1.3 quintales (47 – 61 kg or 103-134 lbs), while the heaviest ingot weighs 2.3 quintales (109 kg or 240 lbs). Five ingots have different marks and stamps on their flat surfaces. 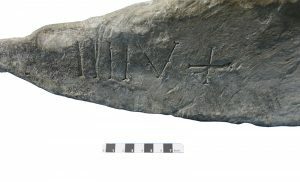 The marks include Roman numerals presumably related to the weight of the ingots although the correlation is still under study (fig. 5). 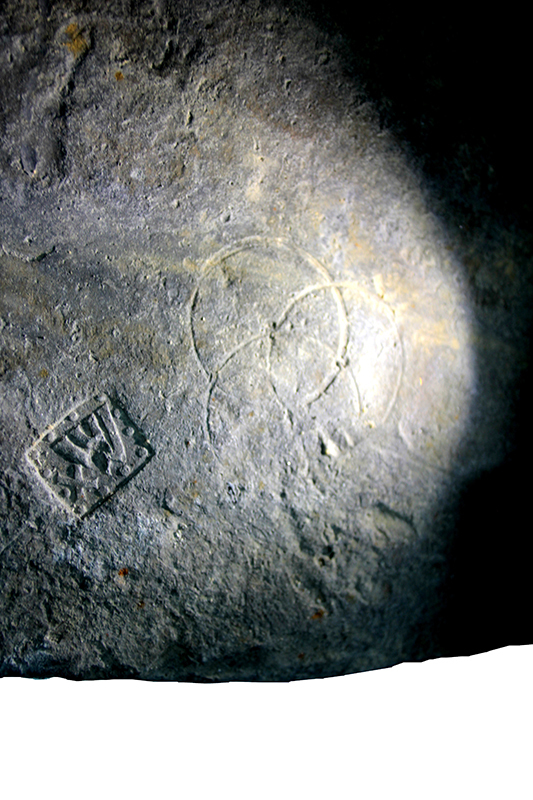 These marks have also been documented on other ingots recovered from the Gran Armada shipwrecks. The stamps have been interpreted as trademarks of the Welser family, one of the most important European bankers of the 16th century. The Welsers were represented by the W letter (fig. 6) which has also been found on copper and lead ingots recovered from the early 16th century shipwreck Oranjemund. The archaeological team intends to conduct isotopic analysis of the ingots to determine their origin and to correlate this information with historical data provided by the study of the ingots’ weights, marks, and stamps. Fig. 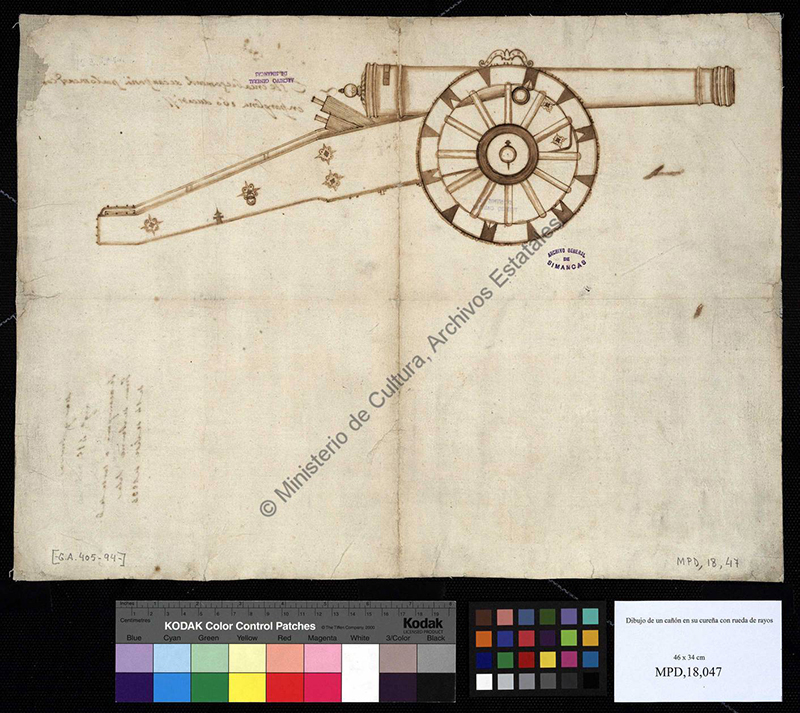 5 Illustration of a late 16th century siege gun carriage (Archivo General de Simancas, Spain). 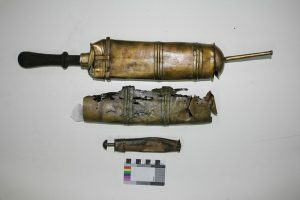 The Punta Restelos shipwreck has also provided three examples of two types of medical syringes made of brass (fig. 7 shows one of the syringes before and after conservation). The largest syringes were probably used in the treatment of constipation or flux while the small one was used to irrigate wounds and treat sexually transmitted diseases such as gonorrhea. They were an important part of the medical equipment of the ship’s surgeon and they appear in the list of medical equipment loaded on two hulks of the 1588 Gran Armada. Similar syringes have been found in other shipwrecks such as the Oranjemund shipwreck (ca. 1530), Mary Rose (1545), and Sea Venture (1609). 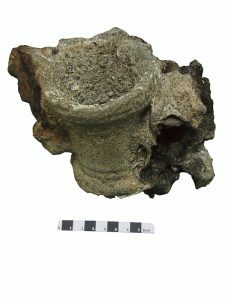 Their study can yield important information about the medical treatments on board late 16th century Spanish ships. The recovered syringes were treated by Victoria Folgueira, the Finisterre Project conservator, to ensure their preservation. Fig. 8 Welser family stamp on boat-shape ingot. 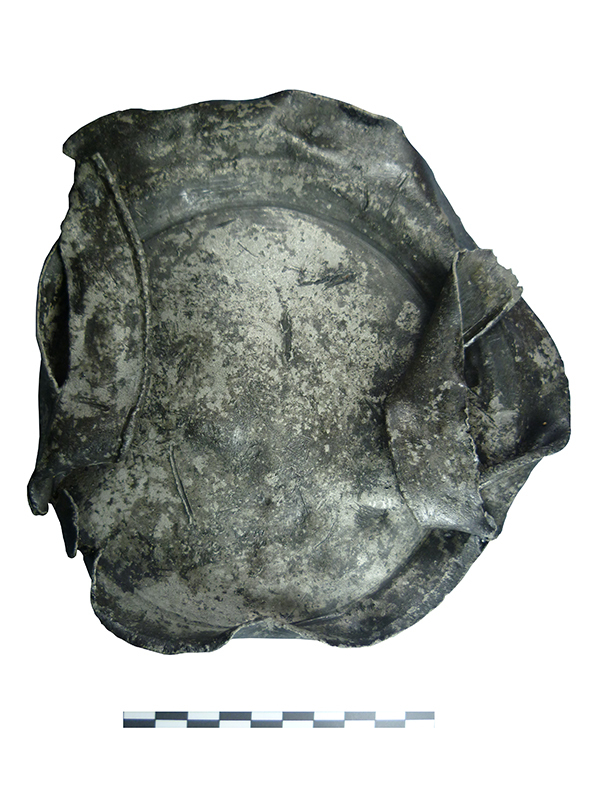 In 2011, two pewter dishes were documented and recovered to prevent their being looted from the site (fig. 8). Pewter is an alloy of zinc, lead and tin that was used in the 16th century to produce dishes, jars, tankards, and other objects such as syringes. Pewter dishes on ships are generally associated with officers since this material was used exclusively by the upper class. Sailors normally used wooden dishes and glasses for their meals. Pewter dishes were documented during the excavation of Santa Maria de la Rosa, another shipwreck of the Gran Armada of 1588, and the ship tentatively identified as Nossa Senhora dos Martires, lost in 1606 near Lisbon. In both of these cases, the pewter dishes featured marks on the rim with the name or initials of their owners; in the Santa Maria de la Rosa, the marks indicated ownership by Captain Matute, an officer of the infantry troops on board the ship. Fig. 7 Roman numerals marks on boat-shape ingot. 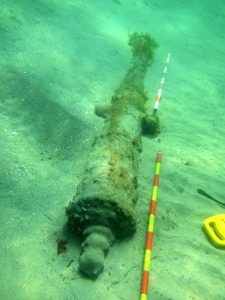 The underwater survey conducted at Punta Restelos has allowed archaeologists to document two cast iron cannon and a bronze pedrero (fig. 9). 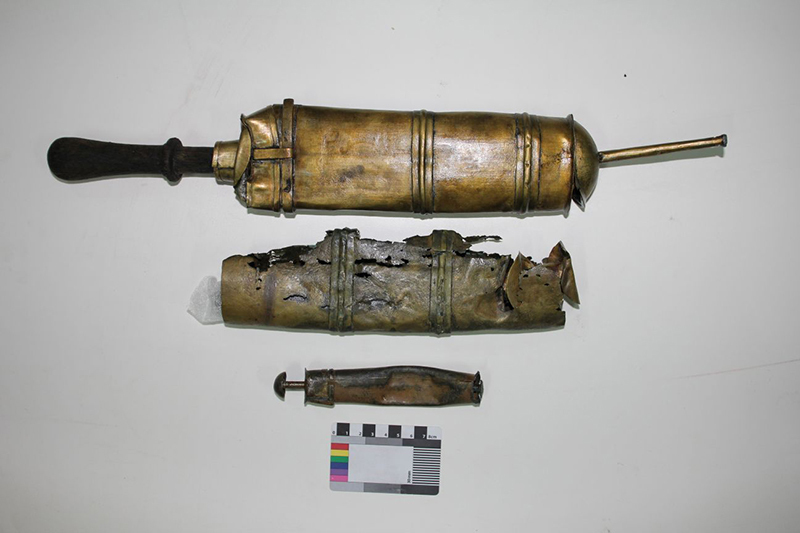 One of the cast iron cannons has been identified as an English gun dated to the last decades of the 16th century (Pers. Comm. Renato Ridella) (fig. 10). On the other hand, the bronze pedrero is similar to a Sicilian gun found during the excavation of La Juliana, an Italian vessel of the 1588 Armada. Pedreros were short range weapons used against enemy crews before boarding. They shot stone balls that fragmented against the ships’ wooden structures forming deadly grapeshot that could wipe out everyone on the deck of enemy vessels. A bronze linstock was also recovered during the 2007 field season (fig. 11). This bronze object was placed at the top of a long pole and held a match used to fire the cannon. It was an unreliable and slow firing system that had a negative effect on the accuracy of the shot and was used until the end of the 18th century when it was replaced by the gunlock. During the underwater survey conducted at Punta Restelos, various planks of the ship’s hull were recorded (fig. 12). These planks are 5 cm wide and do not show any traces of nails or other metal fasteners. However, several treenails, or their holes, were recorded. Each has a diameter of 3.5 cm but no distribution pattern was observed. One of the planks was badly damaged by marine microorganisms and they all have edges that are rounded by erosion. A large wooden structure has also been excavated (fig. 13) during the archaeological survey. The structure has a length of 4.25 m, a maximum width of 1.25 m, and a thickness of 28 cm. Although its shape resembles the form of a rudder, its function has not been clearly determined. It is composed of four pieces held together by a metal strap unrecognizable due to the concretion that covers it. In the same way, the visual analysis of the structure has showed two bolts which fasten the wooden pieces across the whole structure. Finally, seven treenails with a diameter of 3.5 cm have been observed in the upper part of the structure. We intend to conduct further analysis of the structure in order to determine its function and the part of the ship to which it belonged. In conclusion, the Punta Restelos shipwreck represents a unique opportunity to advance scientific knowledge of the ships of the Spanish armadas in the late 16th century. The data produced by the archaeological study of this shipwreck, including those identified as part of Padilla’s 1596 armada, can help us gain a better understanding of shipbuilding techniques, ships’ outfitting, and life on board the vessels used by the Spanish crown during this period. Moreover, these data complement the results of excavations carried out on shipwrecks of the 1588 Armada. Thus, we hope it will be possible to achieve a more objective knowledge about these vessels, and to overcome some of the nationalistic views and interpretations that are still prevalent in various articles and books. During the 2013 season, the team of the Finisterre Project intends to carry out further archaeological survey, artifact analysis and archival research of the Punta Restelos shipwreck. The objective is to identify the name of the ship that sank at Punta Restelos on that fateful night in October, 1596. Fig. 12 Cast iron cannon.